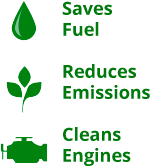 Envirox™ fuel borne catalyst is a scientifically and commercially proven diesel fuel additive which lowers fuel costs, by reducing fuel consumption, with a corresponding reduction in greenhouse gas emissions (CO2) and other harmful exhaust emissions. 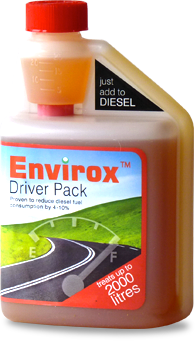 Envirox™ Driver Pack is a 500ml pack with a 25ml dosing chamber; you simply pour Envirox™ into your fuel tank before refuelling with diesel fuel. 25ml will treat a tank of 50-100 litres. Envirox™ will take full effect after an initial induction period, we recommend you treat at double strength for the first 3 treatments to achieve quicker results. Continue using Envirox™ to maintain performance.